I very nearly skipped the editorial this month. There's no law that says I have to inflict Great Wisdom on you single issue. When I don't happen to have any Great Wisdom, I'd rather have an extra page for articles than make up 500 words of drivel. But I do have a few non-great (but maybe interesting) bits of news to pass along . . .
First – yes, this issue is late. Since I edit Roleplayer myself, it sometimes takes the hit when other work gets piled up. And between worldbook deadlines and income-tax returns, we put this issue off. The plan, though, is not to slip the whole magazine schedule a month, but to let the next two issues come out quickly, so the right number of issues will be released this year. I hope you've already noticed the other new thing about the magazine itself. If not, close it and look at the cover. Doing this was surprisingly inexpensive, too! Have I mentioned that we will be doing GURPS Difference Engine, based on the alternate-history Victorian England created by William Gibson and Bruce Sterling? We will. Have I mentioned that we'll be doing GURPS Lensman, based on E.E. "Doc" Smith's classic stories of world-wrecking pulp SF? We will. Have I mentioned that we'll be publishing GURPS Alvin Maker, based on the stories by Orson Scott Card . . . and that Card is writing the worldbook himself? Look for it in 1993. Have I mentioned that . . . Well, it's not signed yet. But we've got another great one all but signed. Stay tuned. 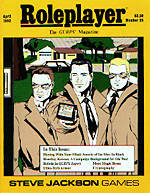 Roleplayer (ISSN 1050-3609) is published bimonthly by Steve Jackson Games Incorporated, Box 18957, Austin, TX 78760. Roleplayer, AADA, Illuminati, GURPS, Autoduel and the all-seeing pyramid are registered trademarks of Steve Jackson Games Incorporated. Other product names mentioned herein are trademarks of Steve Jackson Games Incorporated or their respective publishers. Copyright © 1992 by Steve Jackson Games Incorporated. All rights reserved. Printed in the USA.